Why should walk in District 1? First, because most likely many stay travelers in the region. Both in Pham Ngu Lao for cheap accomodation or luxury hotels in Dong Khoi. Second, most of the attractions in Ho Chi Minh City is located in District 1. Third, the attraction is very easy to reach by foot. And fourth, most importantly, cost effective management. Of course walking around the city such as Ho Chi Minh City is not without challenges. However, should the big cities in southeast countries with a similar character would not be too surprised. Scorching heat often the reason for someone to choose take a taxi. In fact, you can actually walk in a doorway, sheltered walkways trees, as well as walking through the park. Of course, this method will not eliminate the heat of Saigon, but obviously will help you. Travelers can start walk from Pham Ngu Lao. Walk down this road towards Ben Thanh Market. You will find a larger way, the Tran Hung Dao. This road will bring you to a roundabout which frankly sometimes very difficult to cross. You have to cross with confidence, quickly and carefully towards Le Loi. On this road there is Ben Thanh Market. It’s up to you if you want to visit the market first, or skip to late afternoon. When you leave early enough, you should walk on the side of the market, so it can take pictures of activities in the market for a while. In the morning, the market activity is very busy so the photos will definitely exciting and colorful. Runs continue down until you reach the Le Loi Street Pasteur. Here you can turn left and follow the path to find City Hall. Finished pictures taken with this French-style building you can continue step to Notre Dame Cathedral, about one block from City Hall. This cathedral is orange with skelter Mary Major in front of him. There is a garden with beautiful flowers around it. After being photographed with the cathedral, do not move away too far. You will be able to see a large building labeled Bu Dien which means the post office. many tourists who are interested in seeing the architecture of the post office because it is usually a large and beautiful old buildings. 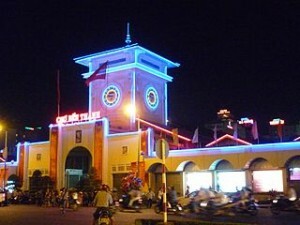 Similarly, the large post office of Ho Chi Minh City. the inside is also very large and beautiful. In the middle row bench, a lot of tourists that go to the post office to send postcards to relatives in their countries. Many others simply rest a while. In the old building and great weather like this is cool. Not bad for a break a while from the hot sun of Saigon. Then continue your steps towards Reunification Museum through Thuyen Thanh Street. The distance is very close, you will not be too tired. However, when including people who are very enthusiastic about history. You will certainly get around this immense four floors museum. certainly quite tiring. Walking tour is not over because you still can go to the War Remnants Museum on Vo Van Tan. Actually, the museum is located in District 3, but the distance is still very close. Only about one block from the Reunification Museum. From Vo Van Tan, visitors can enter the park to return to Tao Dan Pham Ngu Lao. In this park there are usually some Vietnamese coffee and fresh fruit sellers. Iced coffee is perfect for hot weather. Make sure you ask the price first before buying. If you want shopping, travelers can turn to Ben Thanh. The afternoon of the market is still open, and at night there are also a night market. Close your walking tour with a meal at one of the seafood stalls on the outskirts of the Ben Thanh Market. Already complete tour in Ho Chi Minh City this time.